Ms Miller, a civil engineer, is endorsed by EMILY'S List and 314 Action, a political action committee dedicated to electing more STEM candidates. 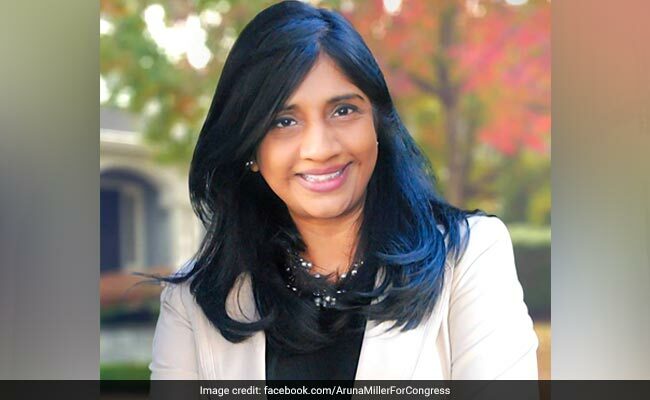 Washington: Indian-American politician Aruna Miller has filed nomination papers to run for the US Congress from a Congressional seat in Maryland. Ms Miller, 53, is currently a member of the Maryland House of Delegates for which she first elected in 2010. The current Democratic incumbent to this Congressional District John Delaney has said that he will not seek re-election and instead has announced to run for 2020 Democratic party's presidential primary. "As an immigrant, I have been afforded incredible opportunities here. I want to pay it forward and make sure we keep the doors of opportunity open to all our citizens," Ms Miller said after she officially filed her Certificate of Candidacy for US Congress for the 6th Congressional district of Maryland. "Congress needs more experienced, progressive legislators at this critical time, if we are going to enact and keep policies that really serve the best interests of the people and our country," said Ms Miller who is considered as one of the active Maryland State legislature. Her mother Hema Katragadda, accompanied her filing. "This is one of the happiest days and proudest moments of my life," she said. She worked for 25 years for Montgomery County. In 2010, she was elected to the Maryland House of Delegates where she represents the 15th District and serves on the Appropriations Committee. The primary elections for Maryland's 6th Congressional District is scheduled for June 26. In addition to Aruna Miller, four others including an Afghan-American Nadia Hashimi have declared themselves in the race. Ms Miller, who came to the US from India at the age of seven along with her parents, said her political interest was sparked by the Bush v. Gore election in 2000, where the fate of the country was not determined by the voters but rather by the Supreme Court. "It was then I realised democracy needed me. Not as a bystander or to cast a vote when there's an election - I needed to engage and empower others every day. I started to volunteer locally which brought me face to face with the needs and problems of others in the community," she said. The current House of Representative has one Indian-American women, Pramila Jayapal from Washington State, who was elected for the first time in the 2016 general elections. Senator Kamala Harris, who is of mixed Indian and African parental heritage is also the first Indian American Senator. She was elected in 2016.